The Penguins finished off the Columbus Blue Jackets in Game 6 to win their first round series 4-2. 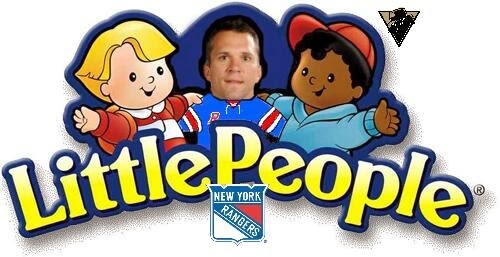 Things will get more difficult from here on out, and up next in the playoff bracket are the New York Rangers. The Rangers reach the Eastern Conference Semifinals by eliminating the Philadelphia Flyers in 7 games. The Penguins hold the playoff lead all time having gone 16-4 in the postseason, including a perfect 4-0 series record, against the Blueshirts. The next stepping stone along Pittsburgh's playoff path: the New York Rangers. The New York Rangers are one of the Original 6 NHL teams and play their games in the iconic Madison Square Garden, but in this case longevity shouldn't be confused with a storied history. In fact, the Rangers have historically been a punching bag, as they've only won 4 Stanley Cups in franchise history, including just one after 1940. This is despite a large portion of their 88 year history being in the NHL's pre-expansion era. In fact, the team's only Stanley Cup championship since WWII, color television, microwave dinners, and 8 track players (Google it) was in 1994. In a now iconic act, captain Mark Messier foolishly predicted the Rangers would beat the much superior New Jersey Devils after falling down in the series 3-2. Luckily for him, the New Jersey Devils picked that exact moment to collapse as a team, and Messier was spared much embarrassment and derision. The team then somehow upset another superior team in the Vancouver Canucks to claim their first Stanley Cup in 54 years, and their only one in the last 20. "Hahaha, well it's not MY money! Sather still has a job after years of gross incompetency is his ability to stay just slightly more competitive than the crosstown New York Islanders. The Rangers hired coach Alain Vigneault during the past offseason, and his proven track record of underachieving with a talented roster in Vancouver makes him a perfect fit for the Rangers. Of course, the team is much less interesting with Vigneault behind the bench than his predecessor, John Tortorella. In fact, many times over the past few years the only reason to watch a Rangers game was in the hopes of Torts blowing up either during the game or in the post game press conference. Despite a brand of hockey bordering on un-watchable, there are some Rangers to keep your eye on during the series. Rick Nash adds toughness and leadership to the NYR. Seen here backing up his captain as Callahan fights Nash's battle for him. Rick Nash is the biggest waste salary on the Rangers team at a cap hit of $7.8 million through waaaay too long 2017-18 season. Nash managed to score only 39 points this season, tied with his rookie season for the worst of his career, and appears to be well on his way towards being washed up just weeks before his 30th birthday. 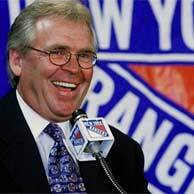 Glen Sather gave up Brandon Dubinsky, Artem Anisimov, Tim Erixon, and a 1st round draft pick to acquire Nash, giving Scott Howson the upper hand in a trade for possibly the first, and only, time during his tenure as Blue Jackets GM. Also at forward the Rangers have Brad Richards, who Sather decided was worth a 9 year, $60 million contract during the 2011 season and somehow wasn't bought out during the 2013 offseason. After posting 100 points in 128 games while struggling under John Tortorella, Richards managed just 51 points under Vigneault this year, easily the worst full season total of his career. In trading for Martin St Louis at the trade deadline this year, Sather continued his plan of making bold moves to acquire over the hill veterans on the down slopes of their careers. 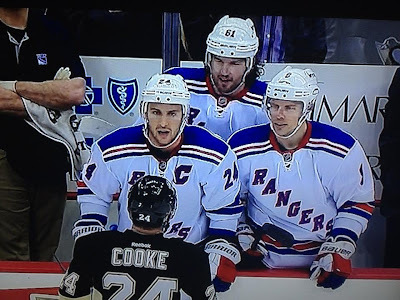 Martin St Louis' small stature hasn't prevented him from being a big douchebag. The Rangers are better on defense, finishing 4th in the league in goals allowed per game (2.32), which they absolutely need to be since they're not very good offensively. Ryan McDonagh is one of the best young defensemen in the league, and was obtained in one of the few roster moves Glen Sather actually got correct: trading Scott Gomez and his monstrous contract. Marc Staal is best known for being the older brother of Jordan Staal, who is best known for being the younger brother of Eric Staal. They do dress 6 defensemen like the rest of the teams in the league, but McDonagh and Staal are the only notables. Henrik Lundqvist also dabbles in goaltending in his free time. Between the pipes for the Rangers is model-turned-goalie Henrik Lundqvist. Lundqvist has 5 Vezina nominations (2006, 2007, 2008, 2012, 2013) and won the award in 2012, though after dropping an F-Bomb in his acceptance speech it's doubtful the NHL GMs will bestow that honor upon him again. While he might be a good goalie, that Vezina caliber goaltender doesn't show up against Pittsburgh, as he has a career 2.48 GAA and 0.912 save percentage against the Pens, including a 2.77 GAA and 0.902 save percentage against Pittsburgh in the playoffs. This season he posted a 2.88 GAA and 0.898 save percentage against Pittsburgh, and there's little reason to believe he's capable of coming into Pittsburgh and stealing a series. He claims to be Swedish, but he acts more Swiss - Swiss cheese that is. With questions in goal and not much of an offensive presence, it doesn't seem likely that the New York Rangers will be changing the 0-for in postseason series against Pittsburgh this year. 5 years ago, players like Rick Nash, Brad Richards, and Martin St Louis could have made this a close series, but with the way the roster is now, and a brutal schedule that has the Rangers playing 3 games in 4 days to start the series after 3 games in 4 days to end the series (6 games in 9 days total), it appears this one will be little more than a formality. Check back in later on in the playoffs when I break down the Pens ECF opponent: either the Montreal Canadiens or the Boston Bruins. Nice positive comments that are helpful and informative - not!!! How about some news or insight. As mom always says, if you can't say something nice, don't say anything at all.